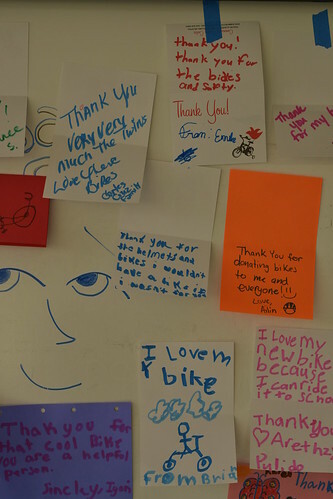 Since the Holiday Bike Drive’s inception in 1995, the Community Cycling Center has provided over 10,000 bicycles to children from underserved communities. 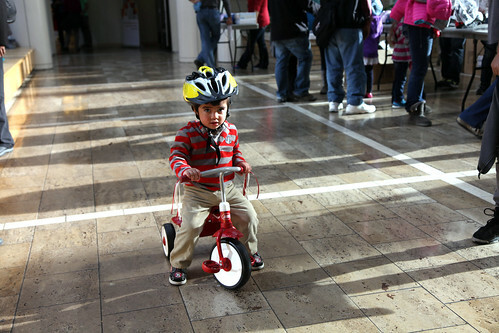 On Sunday, 300 children became Portland’s newest riders after going home with bicycles, helmets, and safety education at the 19th annual Holiday Bike Drive held at Legacy Emanuel Medical Center’s beautiful atrium. 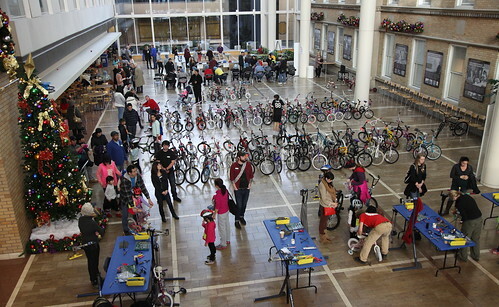 This time-honored tradition would not be possible without our volunteers who spent over 5,000 hours this year cleaning and lovingly refurbishing the bikes. 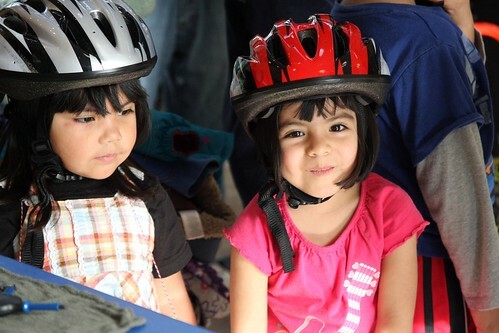 Of course, we could not do this event without our generous supporters who sponsor a child’s first bike or donate bicycles year-round at our bike shop. 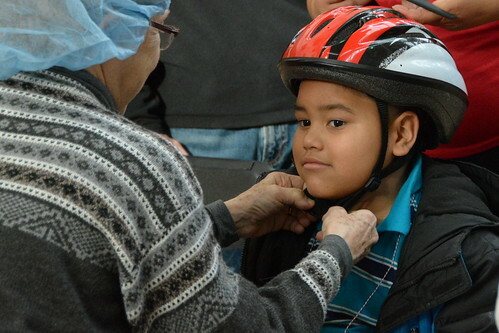 “Helmets are really important because your head is really fragile!” exclaimed one excited kid after taking his new bike for a spin in the bike rodeo. 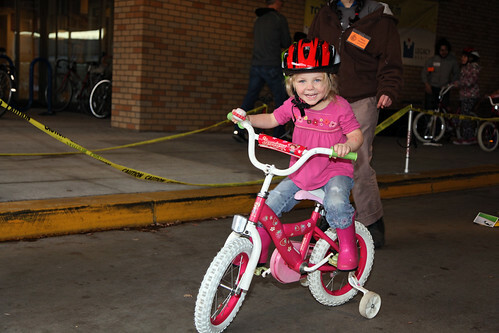 On the day of the event, over 200 volunteers helped guide children through bike safety education lessons on the importance of helmets, hand signals, rules of the road, and more. 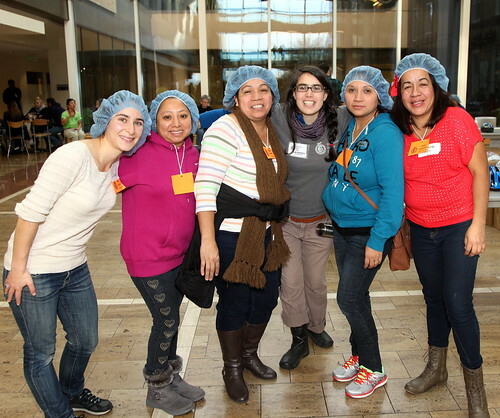 Volunteer interpreters created an inclusive and welcoming event by translating the experience into Spanish, Russian, Vietnamese, and other languages spoken by participants and their families. “Each year, there seems to be one or several amazing stories that I get to hear. 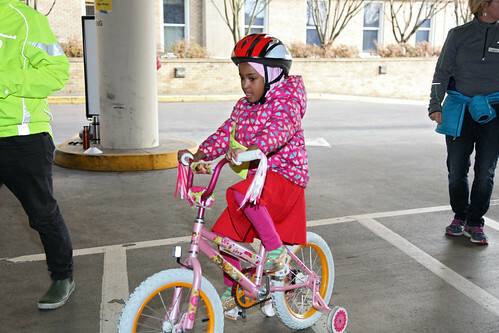 One year it was a little girl who had been in the hospital three of her four years, and her mom traveled home with her on the bus with her and the new bike. This year is no exception, so I’m eager to share. 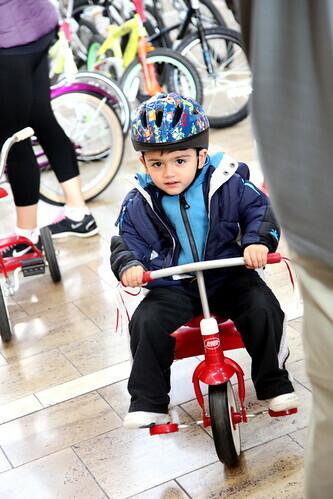 In one of the families I was escorting, the son was getting a bicycle. The mom had a much younger child in a stroller. 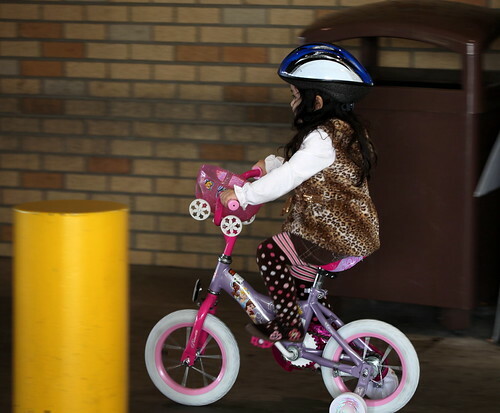 While we were waiting at the mechanic check, I happened to ask the young man, in Spanish, if he had someone in his family that he could ride bicycles with. 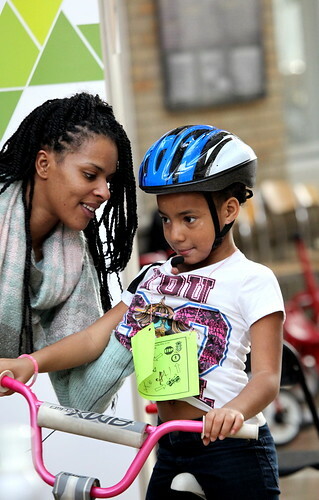 The mom spoke up and said, ‘I ride bicycles!’ She has been a member of Andando en Bicicletas en Cully (ABC) for two years, and was just on a ride on Dia de los Muertos. 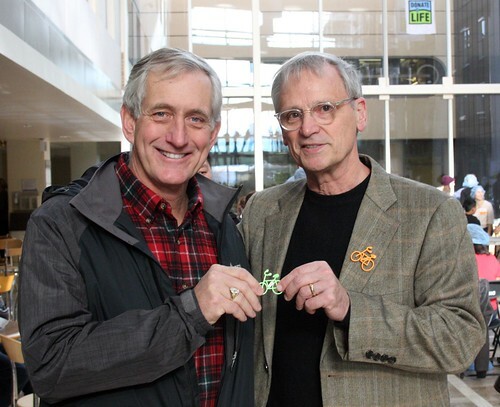 We were honored to have Congressman Earl Blumenauer and Mayor Charlie Hales at our event on Sunday. Don’t forget, 100% of the proceeds from Congressman Blumenauer’s Fruitcake Ice Cream at Salt & Straw benefit the Holiday Bike Drive! 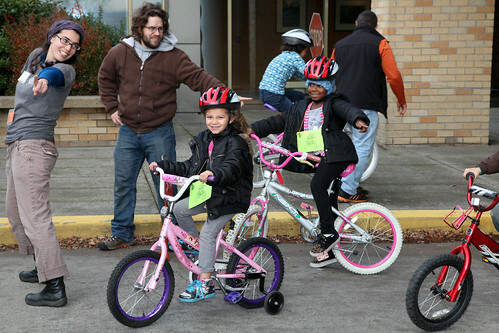 Here are some photos of Portland’s newest riders. 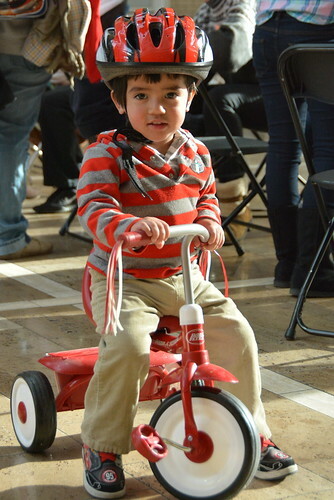 To view the full Holiday Bike Drive album, visit us on Flickr. 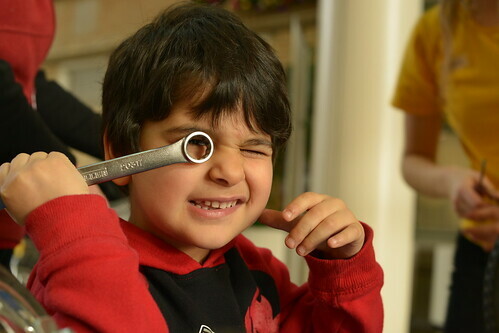 Thank you to our talented volunteer photographers: Mario Segura, Greg Lee, Rohith Gunawardena, Charles Edelson, Ben Latterell, and Sara Hottman.